KNAC.COM - News - ROCK ON THE RANGE 2014 Lineup Announced! ROCK ON THE RANGE 2014 Lineup Announced! Following last year’s expansion to include three nights of music, America’s premier rock festival--ROCK ON THE RANGE--has once again upped the ante by growing to three full days of music for this year’s annual event,May 16, 17 & 18 at Columbus Crew Stadium in Columbus, OH. 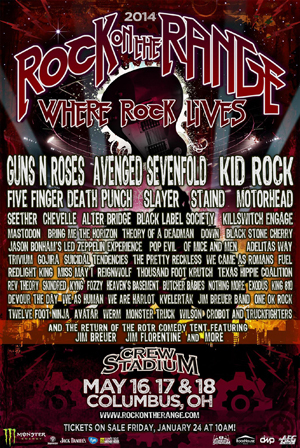 Featuring headlining sets from GUNS N’ ROSES, AVENGED SEVENFOLD and KID ROCK, the lineup includes more than 60 of the World’s hardest rocking acts including: FIVE FINGER DEATH PUNCH, SLAYER, STAIND, MOTORHEAD, SEETHER, CHEVELLE, ALTER BRIDGE, MASTODON, BLACK LABEL SOCIETY, KILLSWITCH ENGAGE and many more (the full line-up is below). Beyond the expanded musical offerings, this year's festival will include the return of ROTR Comedy Tent, featuring Jim Breuer, Jim Florentine and many up-and-coming comedians. Weekend passes including Field GA, Stadium GA, hotel and VIP packages and a stadium 4-pack go on saleFriday, January 24 at 10:00 AM (ET). Additional details about the variety of ticketing, hotel and camping packages can be found at RockOnTheRange.com. Visit the website, www.facebook.com/rockontherange andwww.twitter.com/rockontherange for the most up-to-date information.